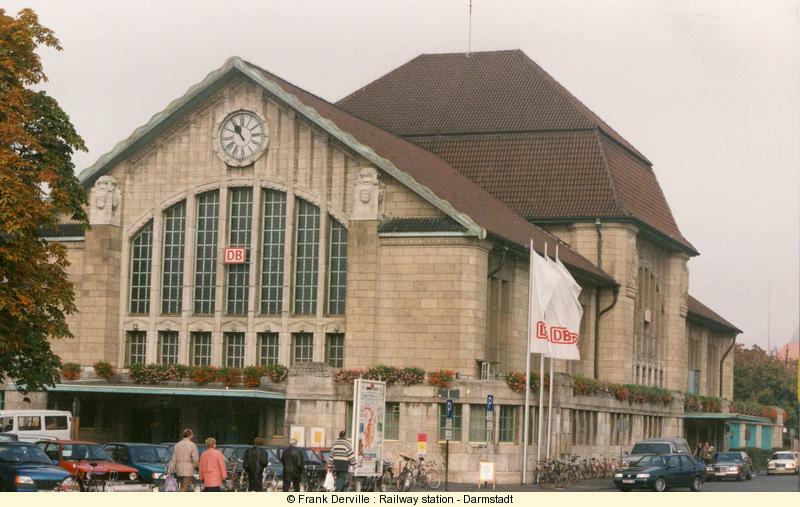 This town is about 30 kilometers away in the south from Frankfurt. 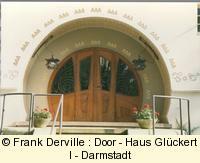 The great duke Ernst Ludwig founded in 1899 a colony of 7 artists. Its aim was to present to people a modern block integrating housing and work place. This block is located on the Mathildehöhe. 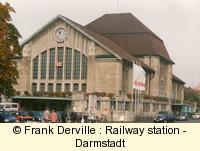 The colony organised 4 exhibitions in Darmstadt in 1901, 1904, 1908 and 1914. 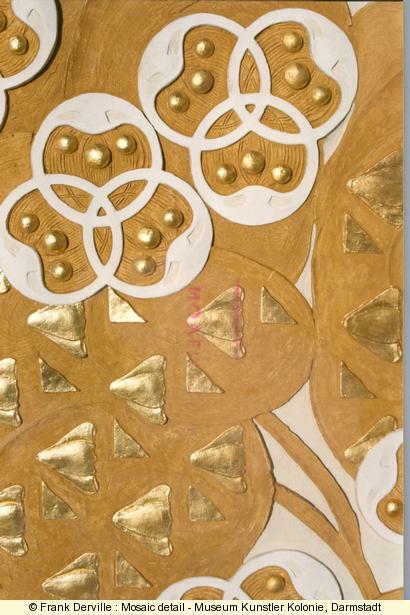 In 1904 arrived the ceramist Jakob J. Scharvogel, in 1906 the glass blower Josef Emil Schneckendorf and in 1907 the book craftsman Friedrich W. Kleukens. In 1914, the group is headed by Albin Müller who replaced Olbrich (dead in 1908). He is surrounded by Bernhard Hoetger (majolica craftsman), Ernst Riegel (goldsmith), Theodore Wende (goldsmith) et Emanuel Margold (pupil of Hoffmann). This 3D map is displayed near the entrance of the Museum Kunstler Kolonie. 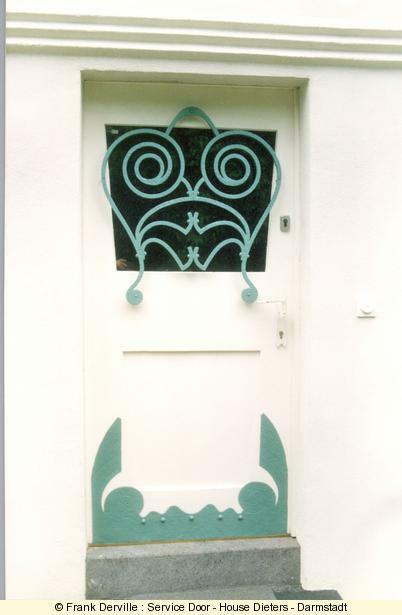 I have only modified the pins to adapt it to the web and my Art Nouveau touristic view. 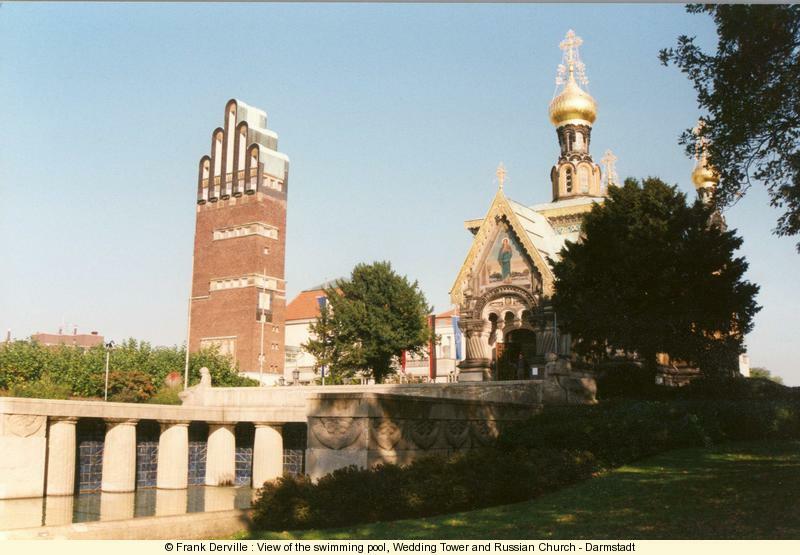 A Wedding Tower (Hochzeitsturm) : It is visitable but don't ( unless the wedding room is open). The fare is expensive for a poor sightseeing. 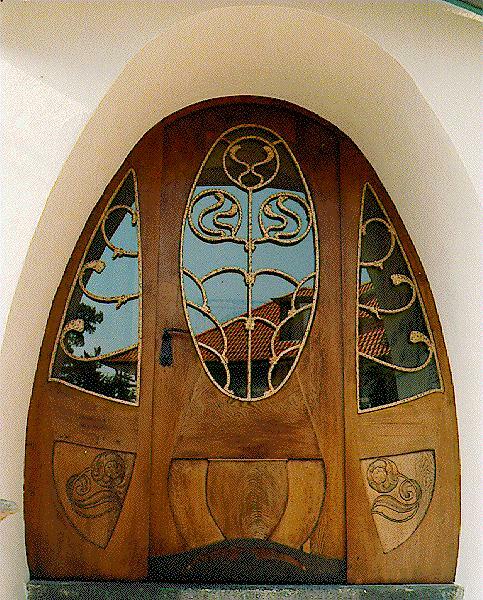 It is an Art Nouveau fan trap. Just enter the hall and look at the mosaic. That is all that you would pay for and it is not worth. 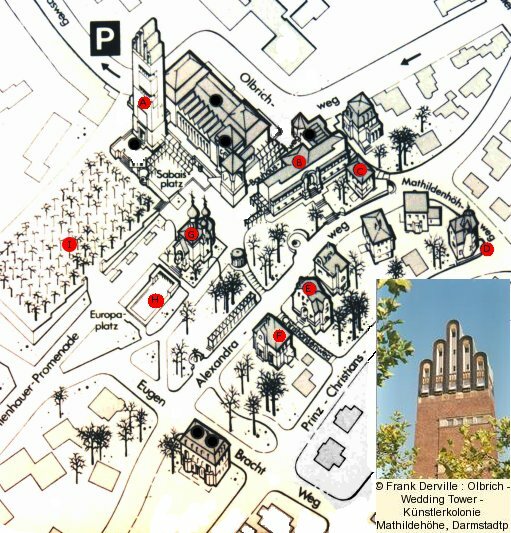 This tower was a wedding gift to the great duke from the town. The symbol is unity and complementarity as the 5 fingers. 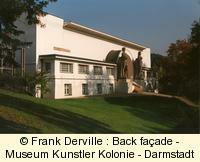 Museum Künstlerkolonie (Museum of the artist colony) (originally called Ernst Ludwig House). 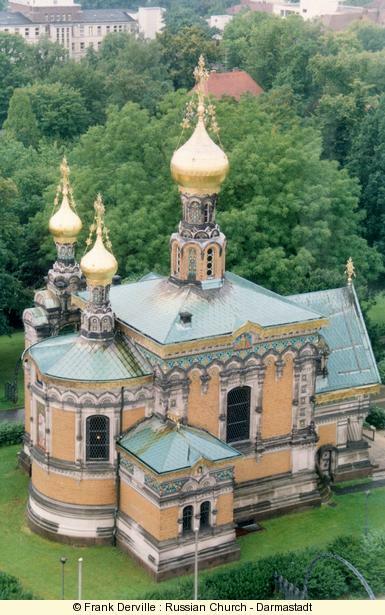 It was built as a temple for the Arts and has now been turned to a nice Art Nouveau museum. C House Olbrich by Joseph Maria Olbrich in 1901 : Olbrich was the leader of the artist group and he built most of the houses of the colony. 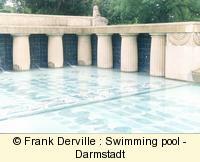 He is Austrian and the first part of his work can be found in Austria and particularly Vienna. 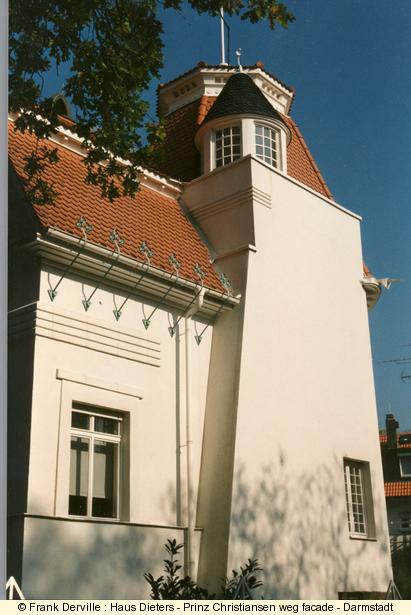 In 1899, he built the Secession building in Vienna, one of the most outstanding of Art Nouveau in this town. 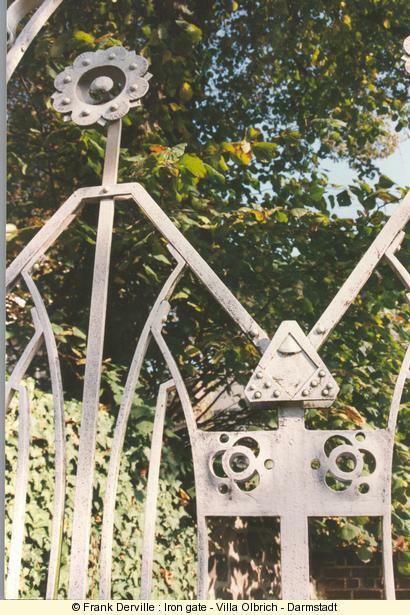 This type of iron gate can be found in several villas in the Mathildenhöhe. 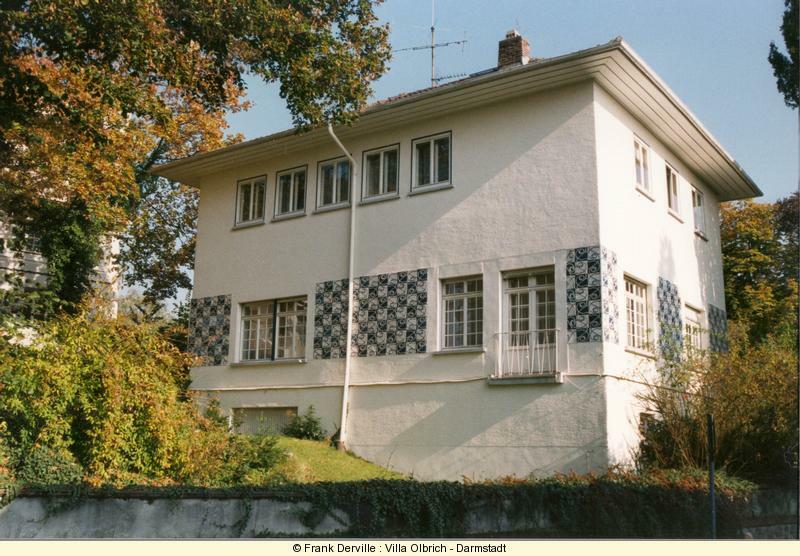 Hans Dieters House by Olbrich in 1900: the most interesting Art Nouveau house in Darmstadt. It is now an art gallery, so it can be visited : the stairway is worth a glimpse. 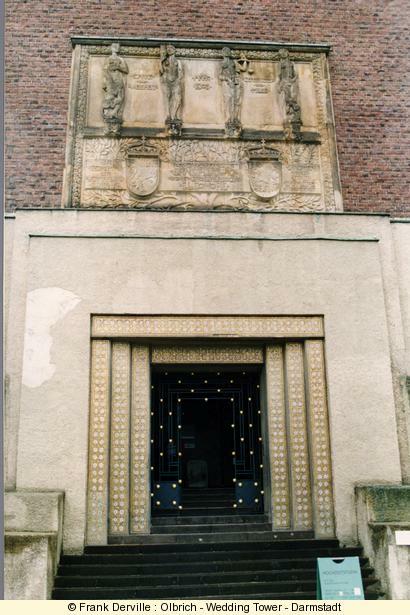 The main door is a jewel with its wooden flower sculpture to the bottom and its stylized organic golden barrels that annonce the design of the Wiener Werkstätte. 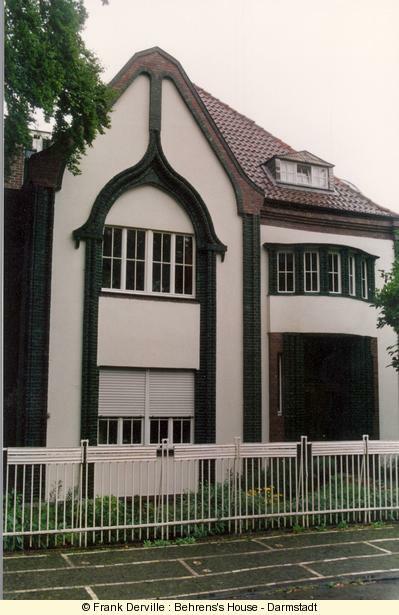 E Grosses Haus Glückert (or Haus Glückert I) by Olbrich in 1900. The door is very interesting, reminding the one in house Dieters. The iron gate is also worth. 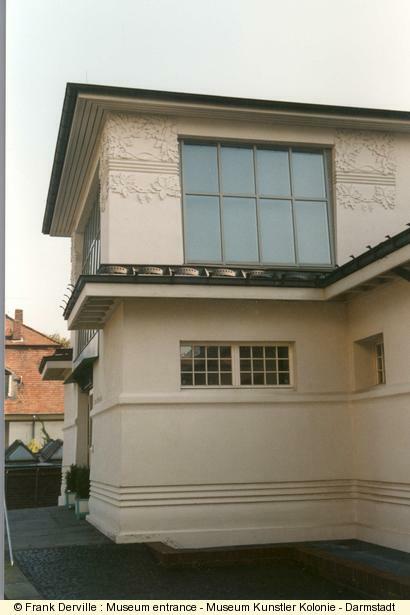 F Behrens House by Peter Behrens in 1901. 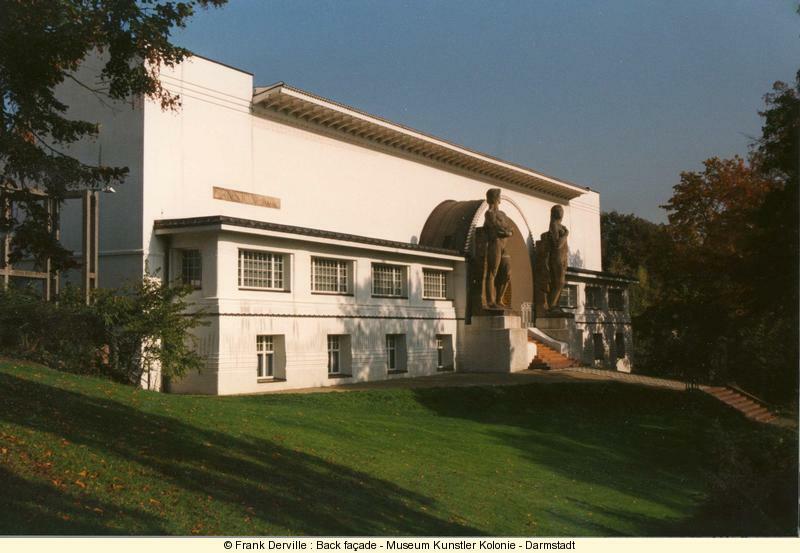 As far as I know it is the first building by Behrens who is now one of the most well known German architect (after Gropius). At that time he was a paintor but he designed every part of the house including spoons and forks! 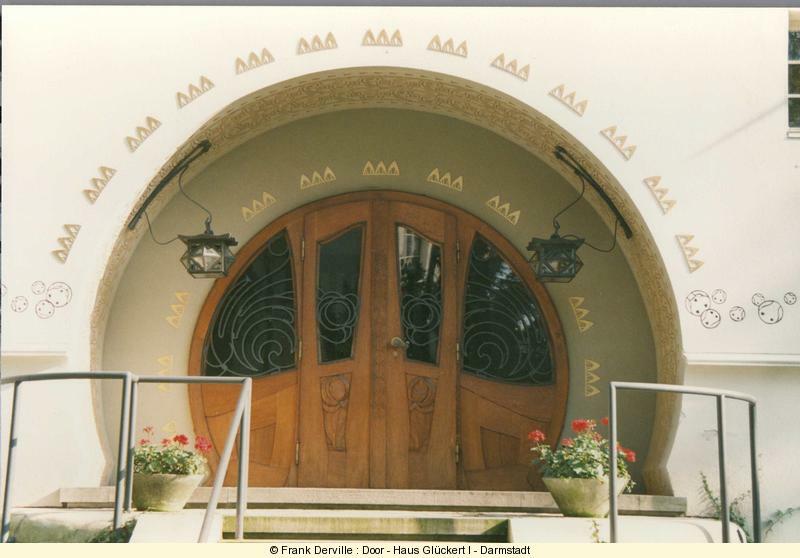 A true Art Nouveau global masterpiece. 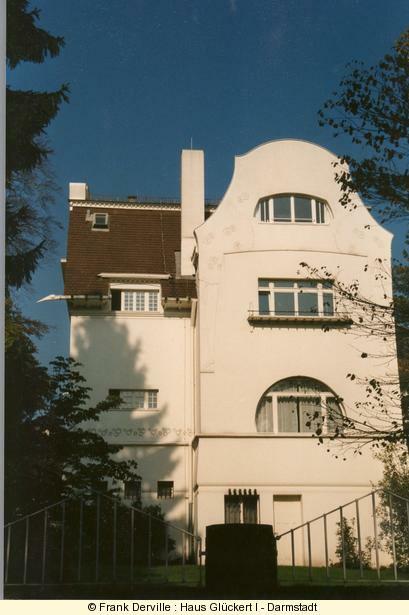 Another great Art Nouveau architects have started as paintor like Behrens : Henry Van de Velde. 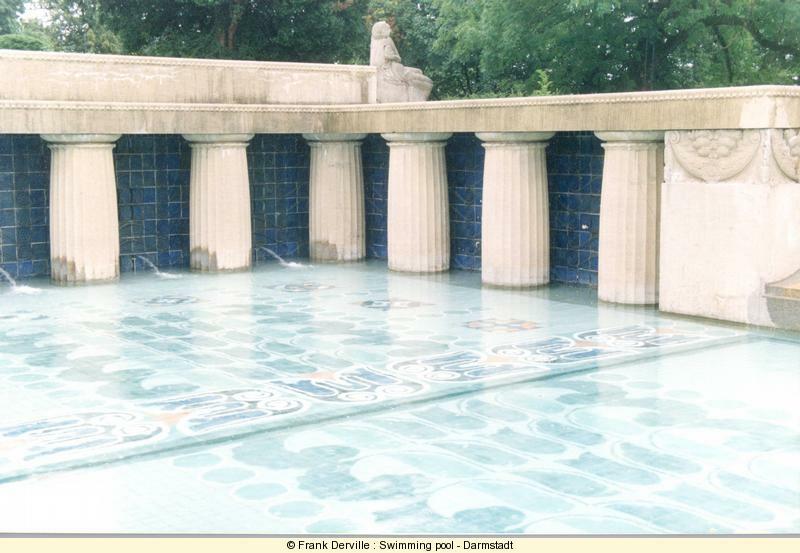 Swimming pool by Albin Müller. 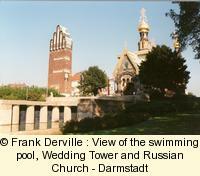 There is a nice view over the russian church and the 48 meter wedding tower. 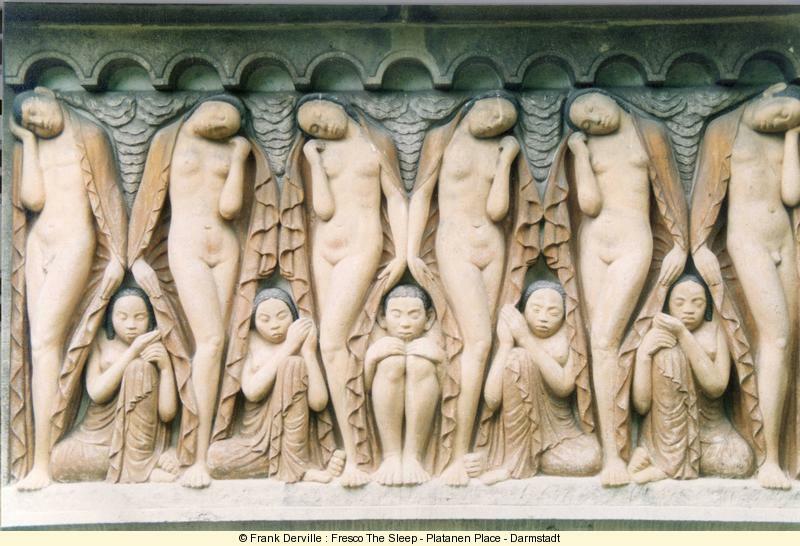 I The Platanen wood hosts a statue (mother with child) and 4 reliefs : spring, sleep, summer and resurection. *** House Gluckert in German. 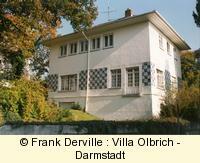 History of this famous house and numerous photos of inside and outside.